Discussion in 'iPhone and iPad Games' started by Repulsa, Apr 13, 2016. One of the hidden gems of the App Store now has a free try before you buy version , with an IAP to fully unlock the whole game. For those of us that already bought it, there is a massive and awesome new update. Check it out if you haven't before, it's free to try! Thank you for posting this, Repulsa! I somehow missed this one, and am downloading it now. 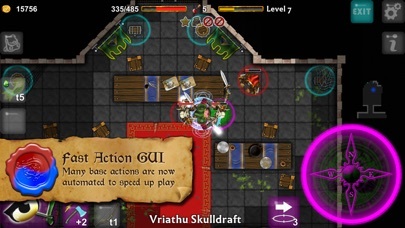 This top down dungeon crawl is a hidden gem I really love it.This is the trial version you can unlock the game with an IAP. If you already own this game there is an awesome new update. 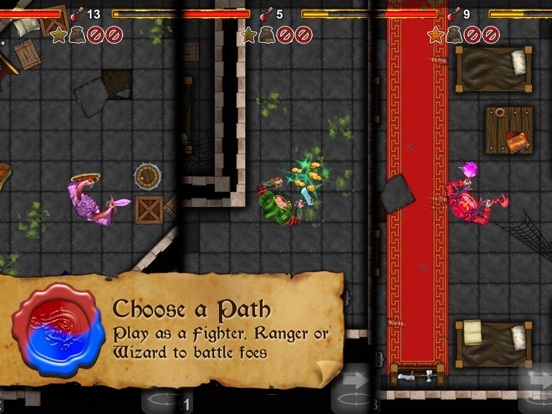 Fun Spray Games Dungeoneers Academy is an classic Action/Fantas - RPG Top-Down Dungeon Crawler Game from the past that still is very much enjoyable if you aren`t getting too much disturbed by the used Graphic Engine in the Game that some might just call out for being Old-School which isn`t bad at all. There isn`t really much that I can tell you about the Game since after around one hour with the Game all I could tell you is that it`s an classic Dungeon Crawler Game where you climb down to those Dungeons and clean them out and for the Gold Coins you might find on your way you can either buy yourself newer gear or sell your old one if you had found a better one meanwhile. Killing everything in the Dungeon or looting all Chests/Barrels and finding the Key for the Exit will give you three Stars and so most of time I got down the Dungeon and pretty much cleared out every single room and killed everything Monster on my way out of the Dungeon. While the Game runs in realtime the Battles are turned based so every single of your your move does count and could be your last one so make always sure that your don`t act like some Hero and storm into an room not knowing what might be hidden behind the door you just have opend up. Afterwards you usually go to the Store and repair all your gear, buy newer once that hold longer or makes more damage or have better stats. Besides that I haven`t encountered anything else what could be done in the Game. 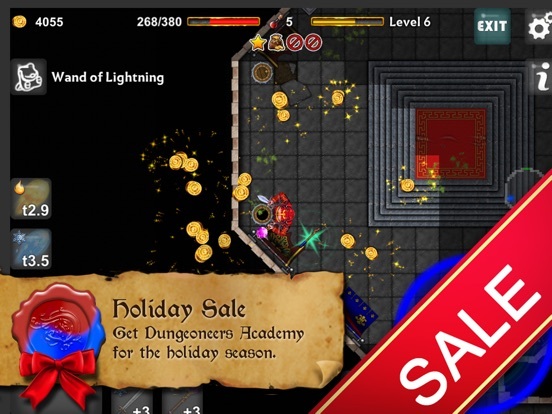 I had a lot of fun in the hour I was playing the Game and the feature that you replay a Dungeon and that it get`s rebuild and stronger mobs get added to it does add a lot of replay value and I`m sure that some that like those kind of Games will for sure therefore enjoy playing Dungeoneers Academy. - Control-System: A couple of times I kinda had the issue that I pressed down and my Hero just went instead either sideways or turned around or something else. I would swear that there is something wrong with how the Directions Pad is reacting to my thumb and I really would like the Developer to look again into it. - Loot: I can understand that Animals don`t usually wear with them Gold Coins or that Chests aren`t always filled with those but when I kill a Human/Goblin/... generally someone/something where it would make sense that it would carry Gold Coins with it and then nothing, abnsolut nothing does drop then I`m asking myself if it shouldn`t get considered that it would make sense. - Inventory: I am pretty sure that the Inventory is at the current moment bugged since I had at least twice the case were I did picked up something and afterwards a.) it wasn`t in my Inventory at all also the Game had told me that I had picked up something and even explained to me how to use it only to afterwards realize that there was nothing at all besides the Gear in the Game that I was wearing already. The first time it was a Sword and the second time it was a Helmet. Besides those three things the Game did run very stable and there were no other issues I had noticed that would make me regret buying the Game at all. 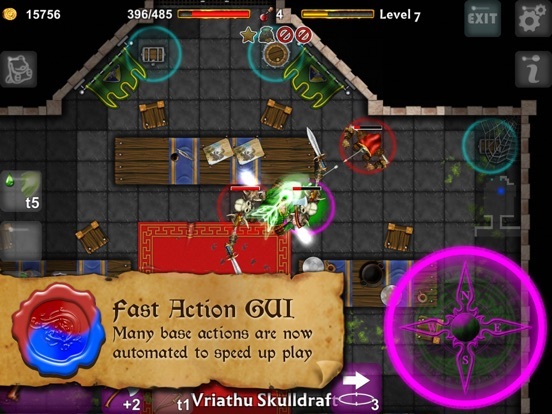 Rating: 4/5 Dungeon Stars - If you like Dungeon Crawler Games you will enjoy playing the Game even with the above known issues that I had encountered. Everyone else should subtract one Dungeon Star and remember that I`m Old School so take my Rating as what it is and accept it or write your own Review about the Game here on the Forum. Great game, we'll worth .99$ for premium. 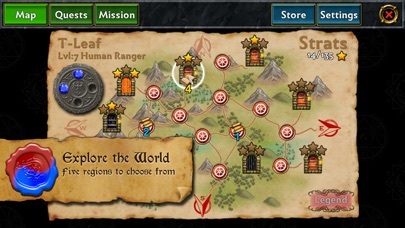 Played first dungeon seems simple might be good. Most annoying tutorial ever. While fairly old, thread for the premium version has a few more posts. This is probably due to removal of duplicates. If you pick up an item you already have, you will keep the newest one with no degrading on it and sell the previous one immediately (full sell price). This can refresh your items so you don't have to repair them. The main reason is to keep you from having to go to the store to sell equipment as much. 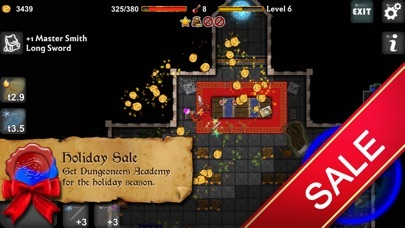 There is no longer a real limit to items you can collect in a dungeon, but you are directed to the store to sell items if you have more than six of any one kind (limit of game save). Previous versions interrupted the game with a popup to ask you to sell an item if you picked up a fifth item. Of interest: If you find a special boss weapon (or ring) and sell it, you should be able to buy it back at any time. But you can't buy these until you pick them up from a boss drop. I hope this makes sense. 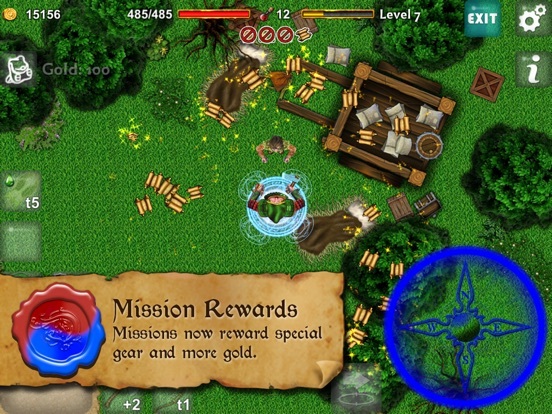 The idea is that selling duplicates immediately and waiting until you exit the dungeon to sell excess items is for speeding up game play in the dungeon. Is anything in particular annoying, like the text is too long or too often? You can skip any tutorial, although you still get interrupted. 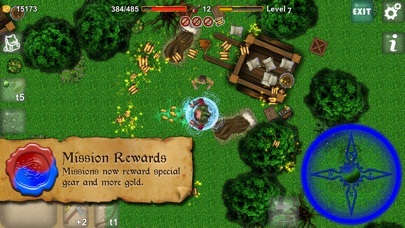 They are intended for people that do not normally play this type of game. We could add a "Skip All" that will stop all tutorials. You can turn all tutorials back on from Settings so this would not be a problem if you did it by mistake. Please add skip all for tutorial. I bought the the game it's fun but is there any skill for combat or do you just use what you have and hope you have enough health potions? No sort of temporary save mid dungeon? Lost all progress by taking a call and having some other apps open as well. I'm very curious about the future of this game, and honestly will at least play the free version with a good chance of getting the premium regardless, but am curious if there are plans to add a stealth/rogue class or any other classes? I had another question or two but I seem to have forgotten, I'll have to come back. But yeah, I always love having at least one rogue-ish or stealth class with my DCers or RPGs, even if it's at least an archer or something, though I prefer daggers lol. And is the premium version 1$? Figured I'd ask instead of hunting down the original app description. The tutorial is annoying because it is not dynamically integrated; meaning, the tutorial throws up the flashing arrow, then an associated dialogue popup, but doesn't allow interaction with the function, while its highlighted. Only after the explanation is given, the popup closed, can the related action be explored. Often, several consecutive tutorial popups activate before you've had a chance to examine the first. For a tutorial to not to be annoying, first, it should not cover the obvious functions, it should allow interaction with the highlighted function while its highlighted and finally, every tutorial popup should include an option to disable the tutorial, all together. A seemless dynamic tutorial is obviously more complex to integrate than a scripted list of popups, especially if it wasn't a consideration from the start of development. A "skip all" seems like a low effort enhancement that would alleviate the entire issue. As you level up, you gain skills. You can look at the two skill slots in the inventory popup to see what they are. There are eight (8) skills for each vocation (class) in two types, mostly a carry over from the original game where you could only ready one of each type. 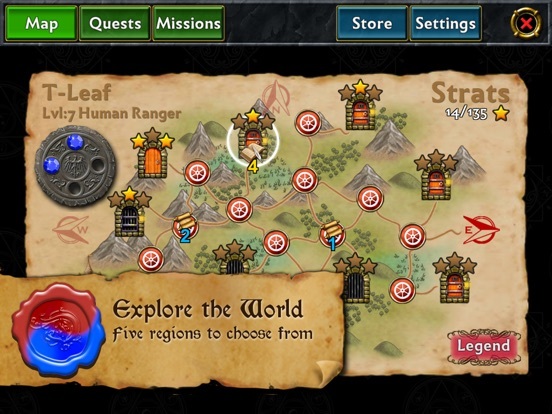 The new ready system allows you to pick any four (4) unlocked skills or scrolls to ready. Each class has a defense and a root skill. 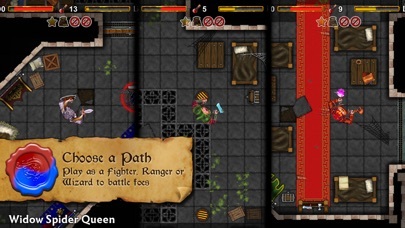 Fighters and rangers have power-ups for weapon use, primary or secondary hand weapons respectively. Wizards generally get new attack spells, and the ranger gets a few too. Skills gain strength as you level up. The only real time you may loose out big is if you had a boss. You don't loose potions and items don't degrade if you abandon the dungeon, so you really lose nothing if you abandon on purpose or it quits. I assume some apps or a few might take it out of memory. The idea was to not really penalize you, and give you a reset if you forgot to buy potions. You can set a reminder in settings when you are low on potions or items have degraded past a given point. Unless I'm missing something, I lose all progress I've done in the current dungeon level, however.